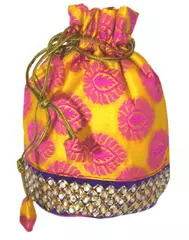 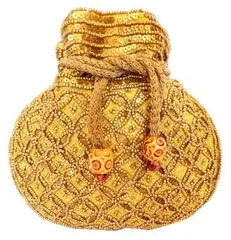 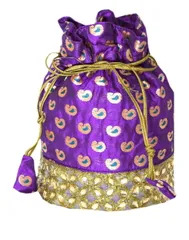 This gorgeous potli bag in satin has beautiful embroidery in golden thread and is embellished with sequins. 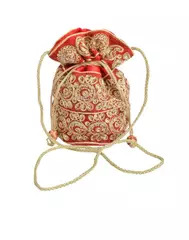 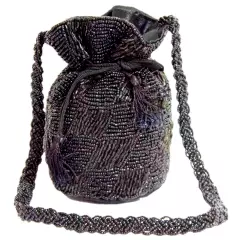 It closes with a drawstring, has a chain style strap made of golden thread, and satin lining inside. 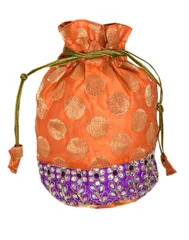 A great party accessory and return gift for weddings etc. 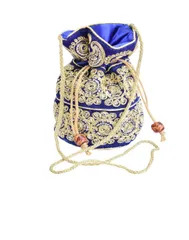 Height: 8.5 in; Width: 7.5 in; Strap length: 46 in. 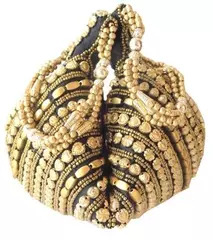 About the craft: Bhopal was once ruled by the Mughals, who left their mark in the form of some beautiful architecture and art forms like this bead work. 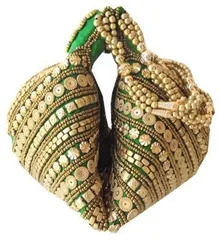 The old city market has many tiny shops in its myriad lanes, which sell masterpieces of bead work and embroidery.